Hopefully you will find something nice to add to your Beatles Collection!!! MAGAZINES, See our Books and Magazines Section!!! Item M001: The Beatles Book - A Reproduction of The Official Fan Club Beatles Monthly Issue Number 1 !!! Offered is a nice reproduction of The Beatles Book Issue Number 1 from August 1963. This magazine was originally published in the UK by the Official Beatles Fan Club. They issued 77 total magazines from 1963 through 1970. This issue is in Excellent condition, and is the same exact size and the same number of pages as the original issue. SALES PRICE $35. 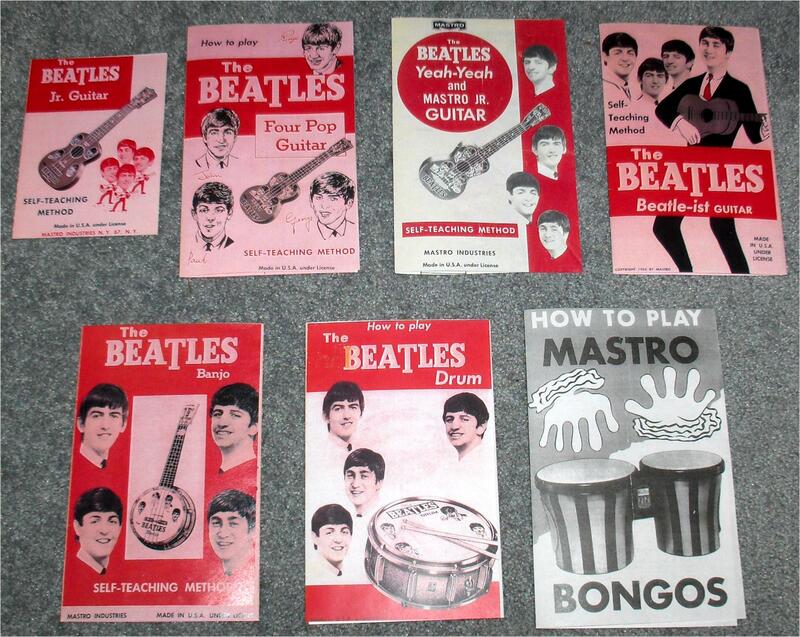 Item M002: A complete set of 7 1964 Reproduction Mastro Beatles Toy Instruments Instruction Booklets!! 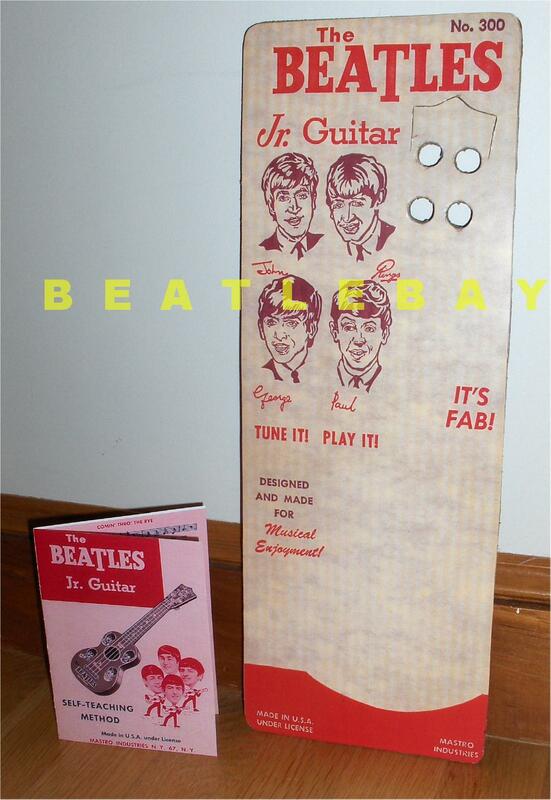 This includes every Beatles toy instrument mfg by Mastro Industries in 1964-66 in the USA. Each booklet is an exact full color reproduction of the toy instrument instruction booklets that accompanied the following toys: Beatles Jr. Guitar, Beatles 4 Pop Guitar, Beatles Beatle-ist Guitar, Beatles Yeah Yeah Guitar, Beatles Banjo, Beatles Drum and the Beatles Bongos. 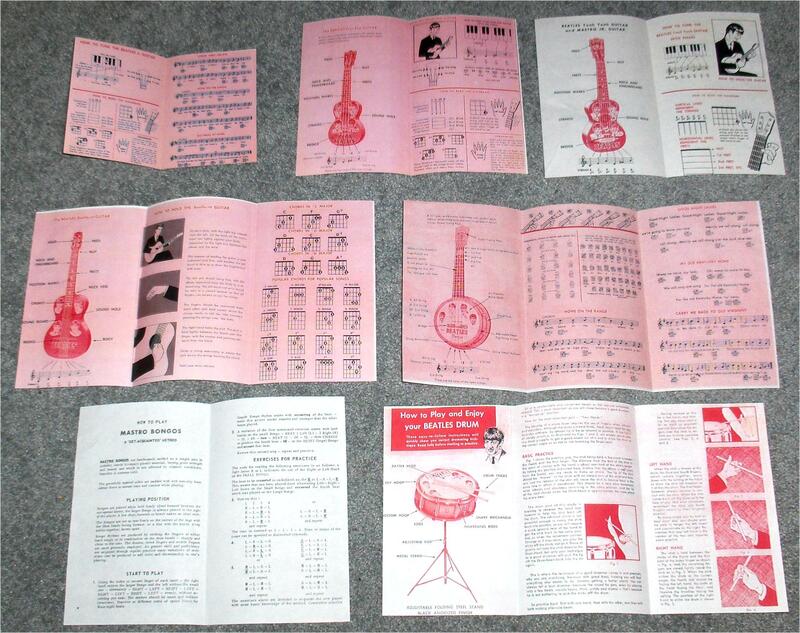 The Beatle-ist guitar, Beatle Drum and the Beatles Banjo are 6 page tri-fold booklets; the others are 4 page booklets. High quality color laser reproductions! 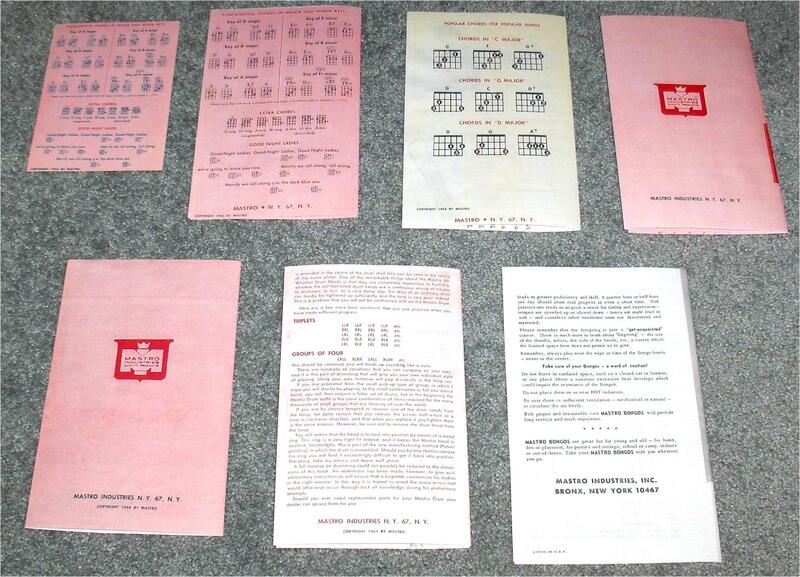 The original booklets usually sell in the $75 to $200 range each so $49 for a set of all 7 is a really good value!!! SALE PRICE $49 for the set of 7 booklets! Item P001: A very rare set of 14 Black & White ORIGINAL PHOTOGRAPHS From John Lennon's "Peace For Christmas" Charity Pop Concert in aid of UNICEF!!! Two Beatles appeared together on Monday night December 15th, 1969 for the first time since The Beatles gave up touring in 1966. George Harrison joined John and Yoko Lennon's Plastic Ono Band for their performance at the "PEACE FOR CHRISTMAS" charity pop concert held on behalf of the United Nations Children's Fund(UNICEF), at the Lyceum Ballroom in London England!!! John dubbed the group "The Plastic Ono Super Group" as it included himself and Yoko, George Harrison, Eric Clapton, Billy Preston on organ, Klaus Voormann on bass, Jim Gordon and Keith Moon on drums, Jimmy Cliff, the Rascals and the Hot Chocolate Band!!! Offered is an ultra rarity: a set of sixteen 8.25" x 11" black & white original photographs from 1969. 14 of them are from John & Yoko's "Peace for Christmas" Charity Concert held December 15, 1969 at the Lyceum Ballroom in London England. One photo is from John & Yoko's Live Peace in Toronto Concert held September 16, 1969. One photo is from one of Yoko's events and shows 12 smaller pictures from this unknown Yoko event. All the others are from the Peace For Christmas Charity Concert. These original photographs are extremely rare and all are in Very Good condition with some light creasing etc. 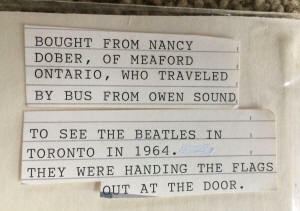 On the backside of one photo of John and Yoko on stage is a hand typed note United Press International dated September 16, 1969 saying John and Yoko were to make an unscheduled appearance in Toronto Canada but showed up 4 hours late to the concert and the 20,000 fans booed them off the stage!!! Incredible!!! The photos from the Peace For Christmas Concert have ink stamps on the backside with associated writing. 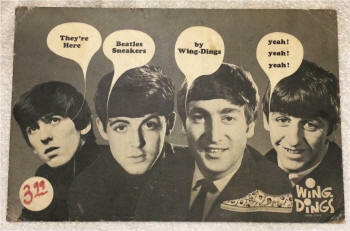 Item P002:: 1964 Beatles Platter Sack !!! 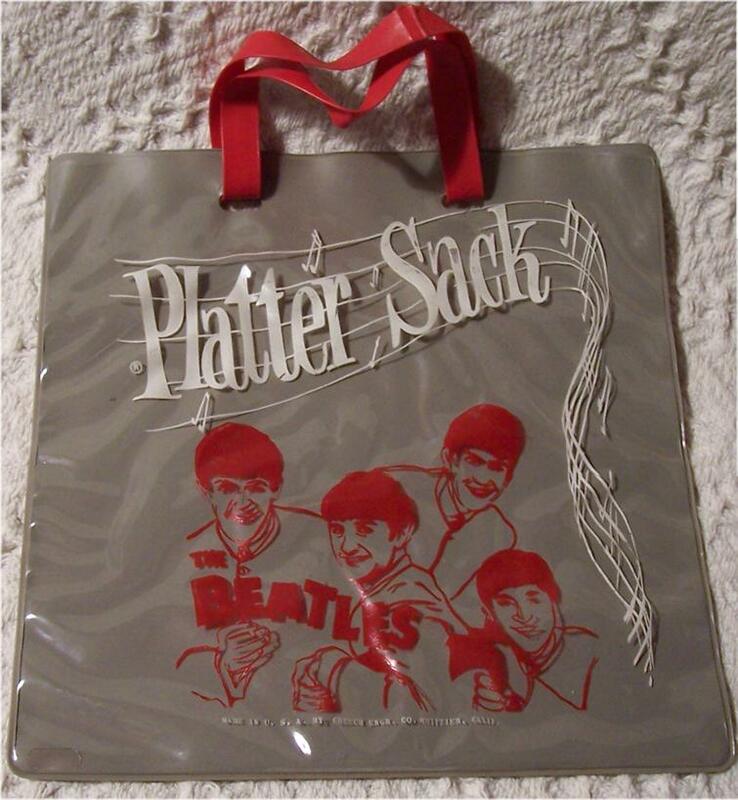 Offered is the very rare Beatles Platter Sack. This was a record carrying case made in early 1965. This was officially licensed in 1965 by NEMS Enterprises Ltd. and is marked as such on the front. This vinyl record carrier was mfg in the USA in 1964 by Creech Engr. Co., Whittier, CA. They mfg 2 versions of The Beatles Platter Sack: the common version simply had PLATTER SACK printed on the front of the vinyl with a one-sided Capitol Records "I Want To Hold Your Hand" 45 picture sleeve inserted inside. 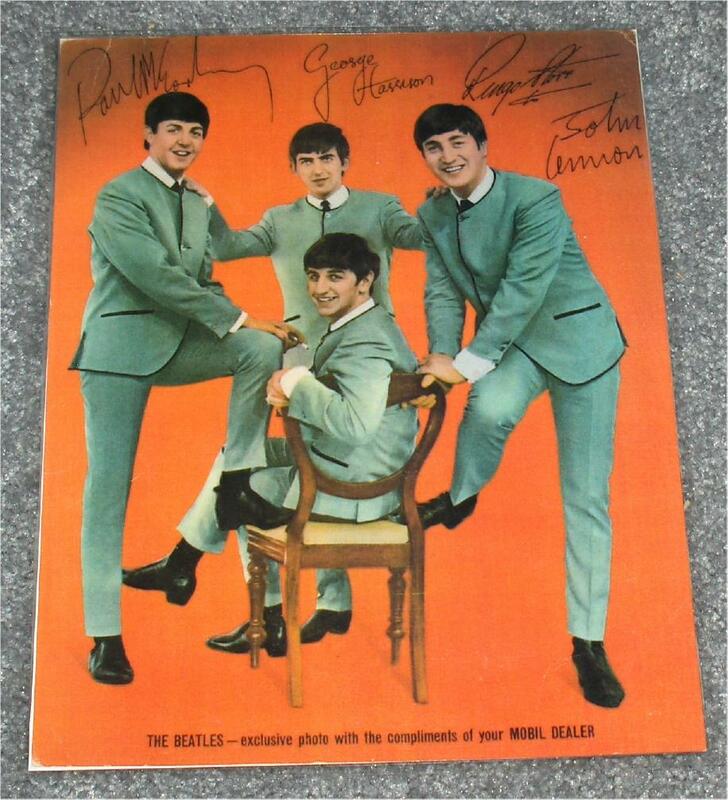 The rarest version actually had The Beatles picture and Logo printed directly onto the front!! Offered is this very rare version!! It's the first one we've ever offered. It measures approx 9" by 9". Clear vinyl pouch with red vinyl handles in Excellent to Near Mint condition!!! SALE PRICE $475. 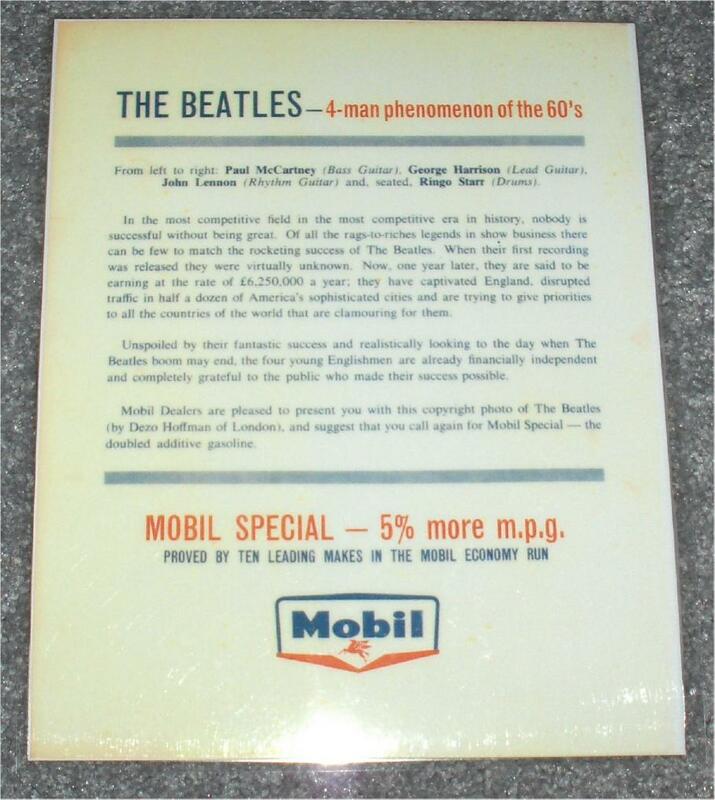 Item P056 : The Beatles 1970's Concert Poster!!! Offered is an original 1970s poster for The Beatles featuring them playing in concert circa 1965. 24" x 36" Edges seem a bit irregular, but would look awesome framed!!! Printed on fairly thick paper. A really cool pic of The Beatles playing live! Overall in Very Good condition. SALES PRICE $149. Item P0073: The Beatles 1978 USA Promotional Poster for the Beatles Tapes double album !!! The Beatles Tapes in-store promotional poster from 1978. A rare poster to find in any condition!! NM- condition. SALE PRICE $35. Item P0074: The John Lennon 1980 USA Promotional Poster for the Double Fantasy LP On Geffen Records !!! The John Lennon solo LP promotional poster for the Apple Records release John Lennon Double Fantasy. VG- with some edge tears. SALE PRICE $49. Item P0075: The Beatles 1982 Very Large & Rare USA Promotional Poster By Capitol Records !!! A Capitol Records Complete Your Collection very large promotional poster. USA. Approx 38" x 38". VG+ condition. A rare poster that's sought after by collectors!! SALE PRICE $249. 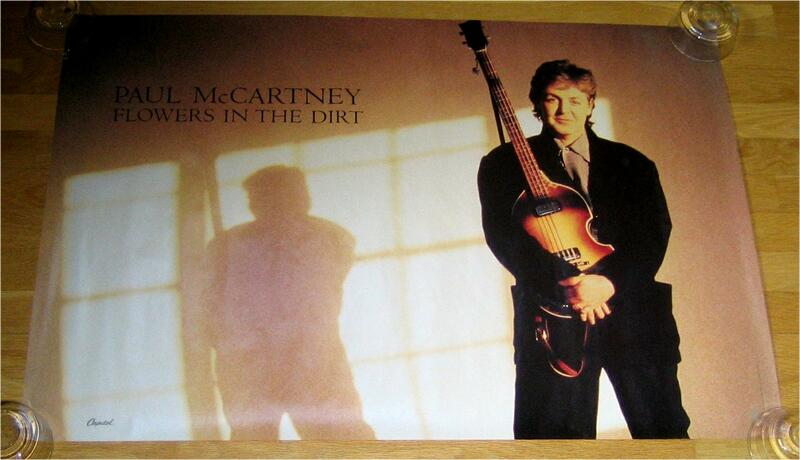 Item P0082: The Capitol Records1989 Promotional Poster for Paul McCartney's FLOWERS IN THE DIRTAlbum. USA. NM condition. approx 36" x 22". SALE PRICE $35. Item P0088: The Beatles 1999 USA Promotional Poster for the Beatles Yellow Submarine LP On Capitol Records !!! The Beatles Yellow SubmarineDisplay Posters, blowup subs, mobiles, etc. were re-released in 1999, the thirtieth anniversary of Yellow Submarine!!! Several different promo posters were created for the occasion. Excellent condition. Approx 18x28. SALE PRICE $39. Item P0089: The Beatles 2000 USA Promotional Poster for the Beatles 1 LP On Capitol Records !!! 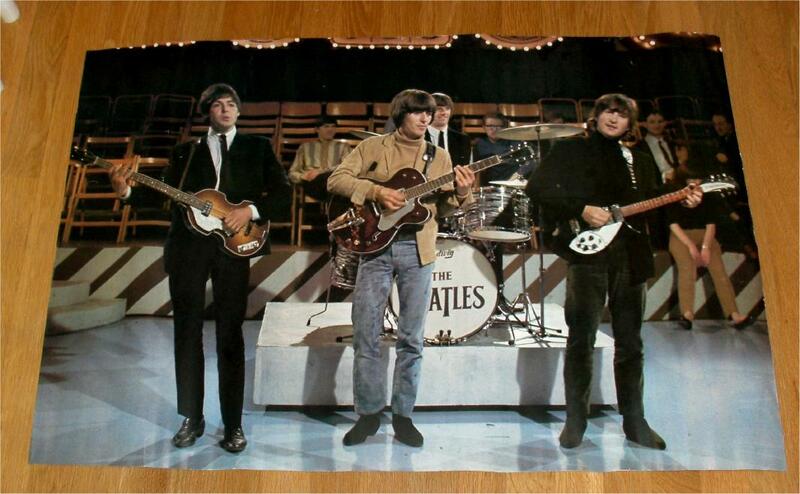 Several different posters and displays were made to promote the Beatles 1 new LP!!! Actually CD as the LP was only made in the UK!! Excellent condition. SALE PRICE $35. Item P116: 1973 GEORGE HARRISON PROMOTIONAL POSTER for the Apple Records LP Living In The Material Word !!! Offered is a original 1973 George Harrison in store promo poster. It has factory folds into thirds. Approx 36" by 12" and features pictures of the front and back cover of George's Living In The Material WorldLP. Overall in VG condition; it has some light creasing, some edge tattering; but overall it's a Great Display Item!! SALES PRICE $129. Item P117: 1977 The Beatles At The Hollywood Bowl 3'x3' Large PROMOTIONAL Cardboard Display !!! 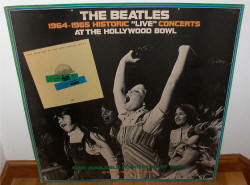 Offered is a original 1977 The Beatles At The Hollywood Bowl in store promo display! It measures approx 36" by 36" and features a great photograph of the crowd at the actual 1964 Beatles Hollywood Bowl Concert!!! Overall in Very Good+ to Excellent condition; it has some light edge wear, no major issues, a light stain you cannot see on the middle of the left edge, a bottom right corner chip. Overall it's a Super Nice Very Large Display Item!! Shipping to the USA only on this piece; Shipping will be by United Parcel Service or Fedex Ground (USA Addresses Only) for $50. SALES PRICE $475. Item P120: The Beatles 1964 Pillow with both Mfg Tags in Great Condition !!! 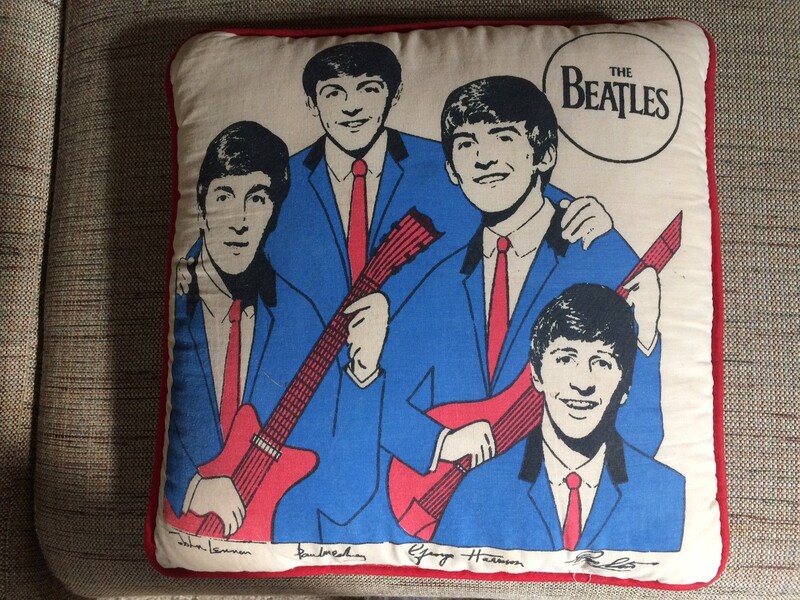 Offered is the 1964 Beatles Pillow with the band holding guitars! It's much rarer than the common version without instruments. 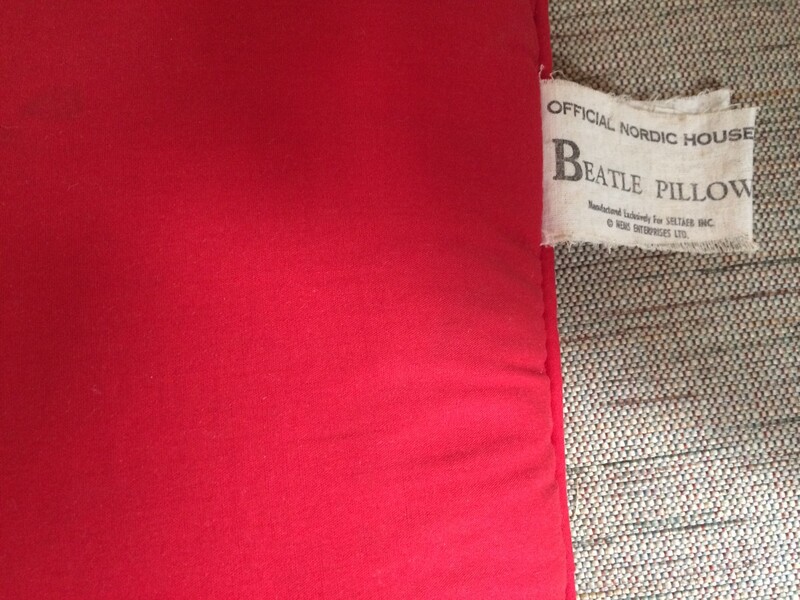 The Pillow has both it's original manufacturers tags too! This pillow was made in the USA under exclusive license from SELTAEB and is marked as such on one of the tags. It was made by Nordic House USA in 1964. Overall it's Very Good+ condition. SALES PRICE $200. BUY IT NOW WITH PAYPAL!!! 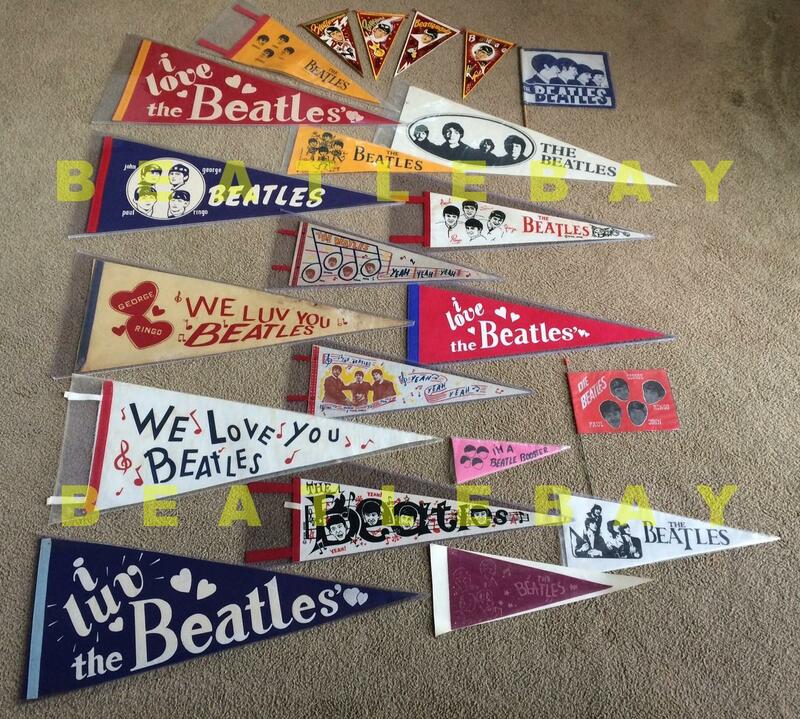 Item P129: A Very Rare Collection of 22 BEATLES Felt PENNANTS from 1964-1966 !!! 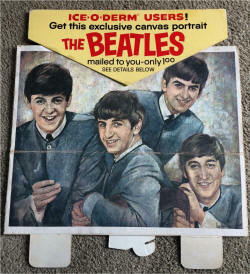 Offered is an original 1964 through 1966 Beatles Pennant Collection. There are 22 different vintage pennants in the collecttion. These took many years to piece together. Condition is Very Good+ to Near Mint on all items. The Beatles Love Songs Pennant is from 1977. They range in size up to 29" by 11.5". 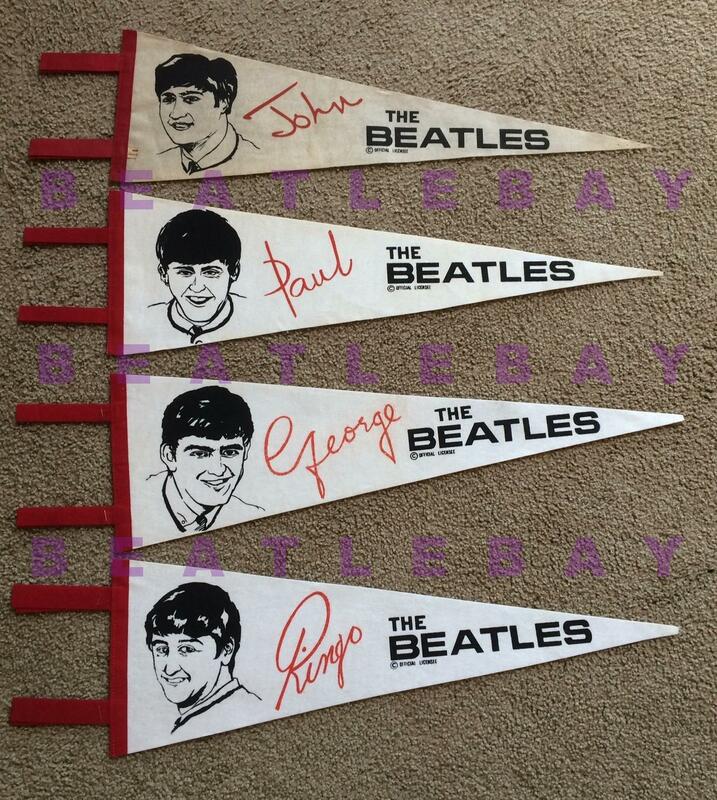 Here's your chance to put together an instant collection of extremely rare Beatles Felt Pennants!! SALES PRICE $2,995. 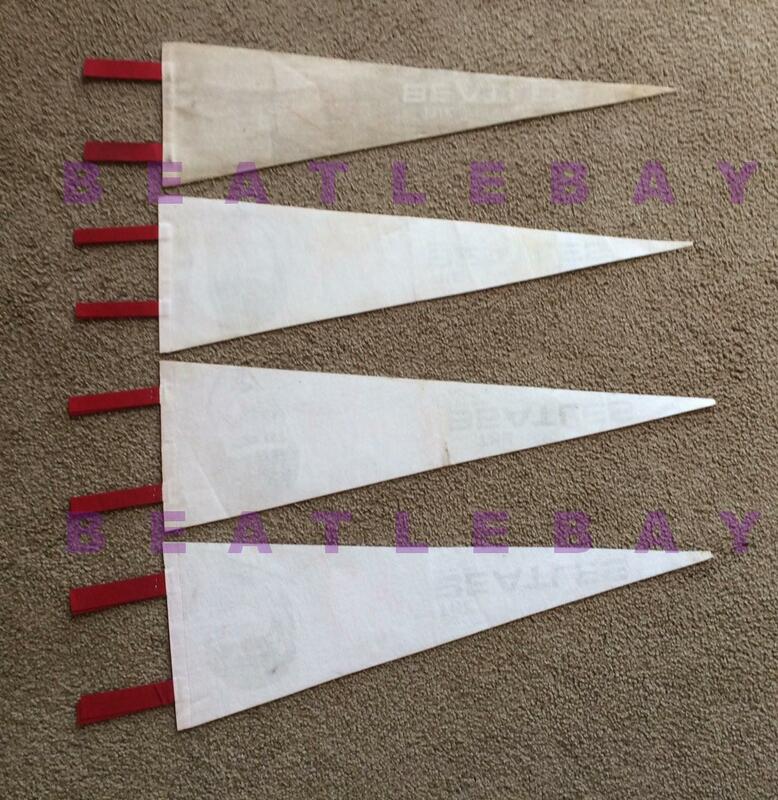 Item P130: The Beatles 1964 Rare Set of 4 Felt PENNANTS Mfg by IRWIN Specialties and Licensed by NEMS Enterprises Ltd. !!! Offered is a very rare set of 4 Beatles Felt Pennants mfg by IRWIN Specialties in Canada exclusively for NEMS Enterprises Limited. Each white felt pennant measures approx 23" by 7" tall. The John Lennon pennant is somewhat faded; the Paul McCartney, George Harrison and Ringo Starr pennants are like new condition except there's a tiny bit missing from each tip. The John Lennon pennant still has the remains of the original manufacturers tag which stated "Made in Canada by Irwin Specialties". Each felt pennant has a large drawing of each Beatles head along with their facsimile autograph in red print; each also says THE BEATLES in large black print and under that states " OFFICIAL LICENSEE". Irwin Specialties in Canada had the exclusive license to market Beatles pennants in 1964 and there were several different types and sizes. Each one was officially licensed by NEMS Enterprises Limited and is marked "OFFICIAL LICENSEE". See our Group Beatles Pennant by IRWIN below! This is a very rare set to find!! Overall the set is in Very Good+ to Excellent condition. Item P131: The Beatles 1964 Rare "I LUV THE BEATLES" FELT PENNANT !!! Offered is a rare Beatles Felt Pennant made and sold in the USA in 1964 through 1966. This felt pennant measures approx 29" long by 11.5" tall. The pennant is blue felt and has printing in white with white hearts all over. This version has LOVE spelled "LUV". 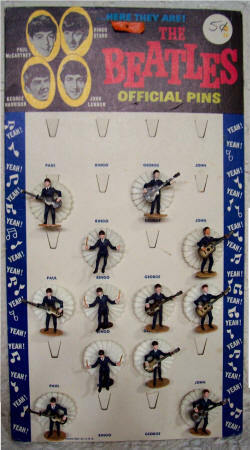 These were sold at Beatles concerts all across the USA in the early 1960s! Overall the pennant is in Very Good+ to Excellent condition with several light vertical creases barely noticeable on the rear. SALES PRICE $225. Item P132: The Beatles 1964 Rare "BEATLES" FELT PENNANT !!! Offered is a rare Beatles Felt Pennant made and sold in the USA in 1964 through 1966. This felt pennant measures approx 29" long by 11.5" tall. 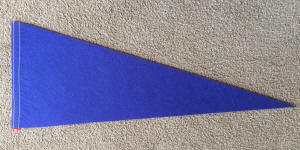 The pennant is blue felt and has printing in white with white hearts all over. 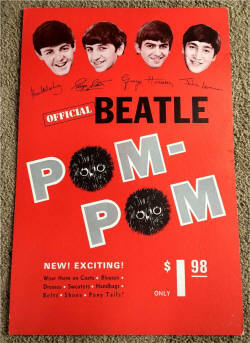 These were sold at Beatles concerts all across the USA in the early 1960s! Overall the pennant is in Excellent condition. SALES PRICE $195. Item P133: The Beatles 1964 Rare "BEATLES 4 MOP TOPS" FELT PENNANT !!! 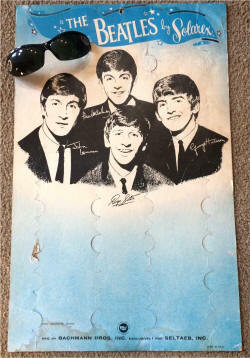 Offered is a rare Beatles Felt Pennant made and sold in the USA in 1964 through 1966. This felt pennant measures approx 29" long by 11.5" tall. The pennant is green felt and has BEATLES in white with 4 white Mop Tops with first names printed in white. These were sold at Beatles concerts all across the USA in the early 1960s! Overall the pennant is in Excellent condition. Item P134: The Beatles 1964 Rare "I LOVE THE BEATLES" FELT PENNANT !!! Offered is a rare Beatles Felt Pennant made and sold in the USA in 1964 through 1966. This felt pennant measures approx 29" long by 11.5" tall. 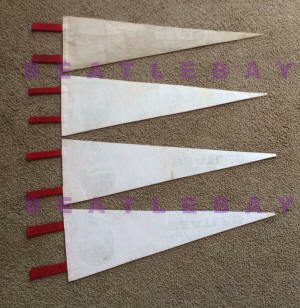 The pennant is red felt and has printing in white with white hearts all over. This version has LOVE spelled correctly. These were sold at Beatles concerts all across the USA in the early 1960s! Overall the pennant is in Very Good+ to Excellent condition with several light vertical creases barely noticeable on the rear. SALES PRICE $225. Item P135: The Beatles 1964 Rare Canadian BEATLES PENNANT !!! Offered is a rare Beatles Pennant made and sold in Toronto Canada in 1964. This felt pennant measures approx 10.25" long by 7.75" tall. 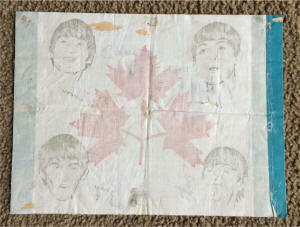 The pennant is red felt and has The Beatles faces and first names printed with 3 red maple leaves in the center. Blue border. Very Rare item! On the backside of the pennant is some faded writing "Keep Canada Beautiful Forever". 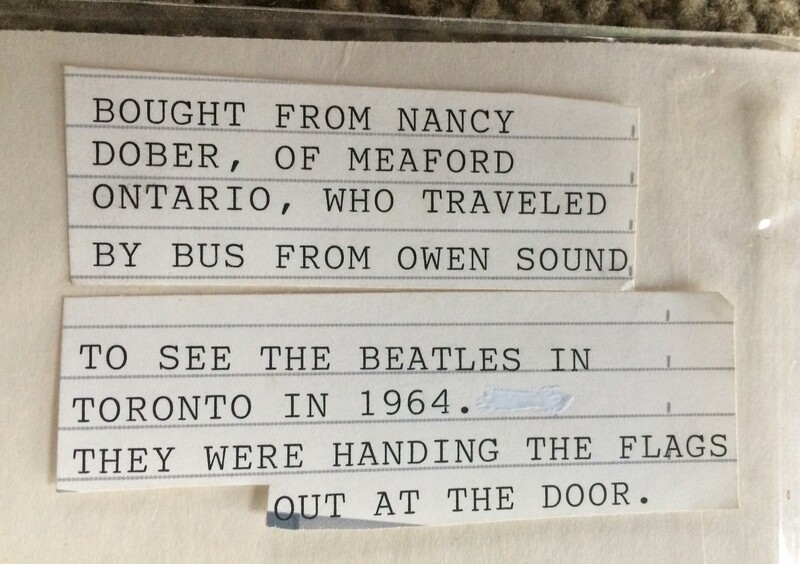 There is a note that comes with this pennant from the original owner: they traveled by bus to see the Beatles play in concert in Toronto in 1964. 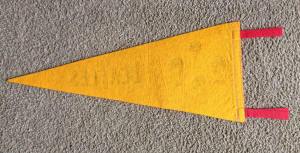 Overall the pennant is in Very Good condition with several vertical and horizontal creases. A very rare item!! Item P136: The Beatles 1964 Rare FELT PENNANT - NEMS ENT LTD !!! Offered is a rare Beatles Felt Pennant made and sold in the USA in 1964 through 1966. This felt pennant measures approx 17.5" long by 8" tall. The pennant is orange felt with red borders and has printing in black with The Beatles faces, their first names; on the right side is printed "THE BEATLES" and under that is marked "NEMS ENT LTD". These were sold at Beatles concerts all across the USA in the early 1960s! Overall the pennant is in Very Good+ to Excellent condition. SALES PRICE $150. Item P137: The Beatles 1964 Rare Caricatures BEATLES FELT PENNANT !!! Offered is a rare Beatles Felt Pennant made and sold in the USA in 1964 through 1966. This felt pennant measures approx 17.5" long by 7" tall. The pennant is yellowish orange felt and has printing in black with caricatures of each Beatle, their first names plus it says "THE BEATLES". The manufactuere of this pennant is marked vertically on the pennant... it was made by the American Flag Company in Clifton, NJ. It is also marked "Licensed by SELTAEB, Inc." which was the Beatles American Licensing Company. It is rare to find original memorabilia marked SELTAEB! Overall the pennant is in Excellent condition. SALES PRICE $170. Item P138: The Beatles 1964 Rare Canadian BEATLES GROUP FELT PENNANT Mfg by IRWIN Specialties and Licensed by NEMS Enterprises Ltd.!!! Offered is a very rare Group Beatles Felt Pennant mfg by IRWIN Specialties in Canada exclusively for NEMS Enterprises Limited. This white felt pennant with red piping measures approx 23" by 7" tall. 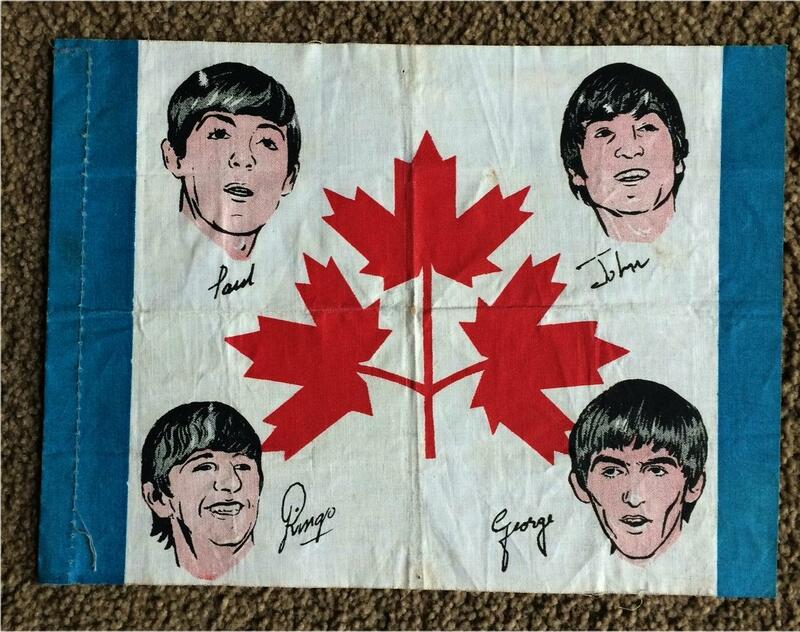 This is a rare Beatles Felt Pennant made and sold in Canada from 1964 through 1966. It is a companion piece to the other IRWIN Specialties pennants we have listed too! 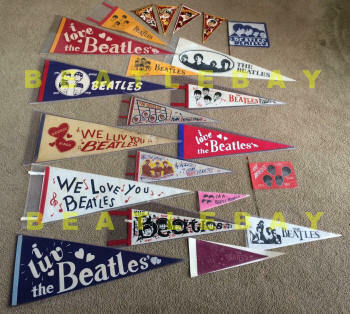 Irwin Specialties in Canada had the exclusive license to market Beatles pennants in 1964 and there were several different types and sizes. Each one was officially licensed by NEMS Enterprises Limited and is marked "OFFICIAL LICENSEE". 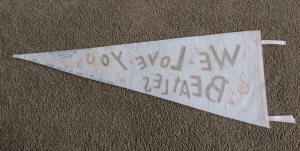 Item P139: The Beatles 1964 Rare "WE LOVE YOU BEATLES" FELT PENNANT !!! Offered is a rare Beatles Felt Pennant made and sold in the USA in 1964 through 1966. This felt pennant measures approx 28.5" long by 11.5" tall. The pennant is white felt with red piping and has printing in red and black with musical notes all over. These were sold at Beatles concerts all across the USA in the early 1960s! 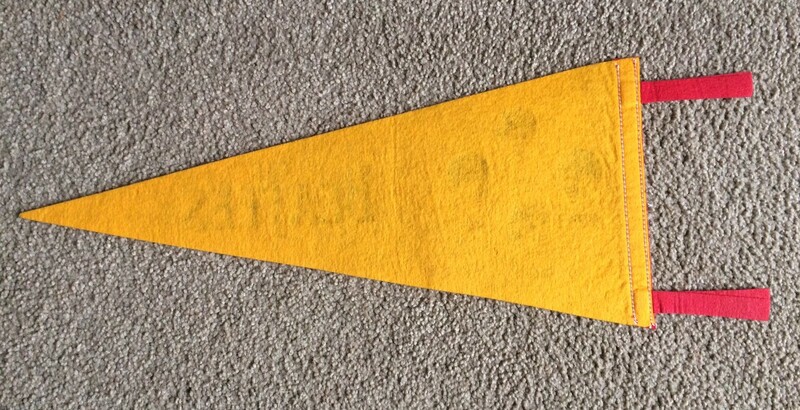 Overall the pennant is in Very Good+ condition; there is a hard to see yellow age stain on the front. On the backside is handwritten in ink from the original owner: "From the 1966 concert August 12, 1966 Row 15 George smiled at Jane and me. He's Gear!". How cool is that? SALES PRICE $195. Item T003: The Beatles Rare 1966 Shea Stadium USA Concert Ticket Stub !!! Offered is a nice original 1966 Beatles Concert Ticket Stub from August 23, 1966 !! 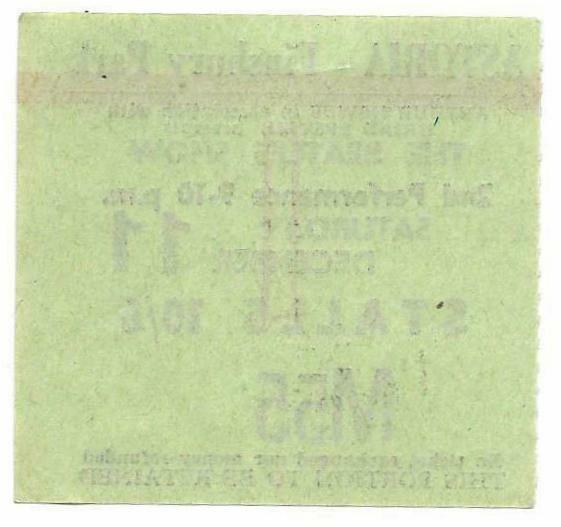 It's 1.5"tall by 3.5" wide and in Very Good+ condition; there are 3 evenly spaced vertical fold lines as the ticket was likely folded up for keeping way back then. The vertical folds are difficult to see on the front side. There are no stains or other distractions to the ticket. The back is nice and clean. The ticket is printed on heavy card stock type paper. A Terrific Display item!!! SPECIAL SALES PRICE $250. $200. 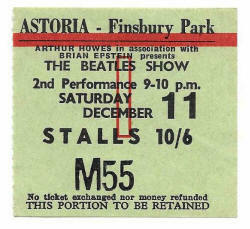 Item T004: The Beatles Rare 1965 Finsbury Park Astoria London England Concert Ticket Stub !!! 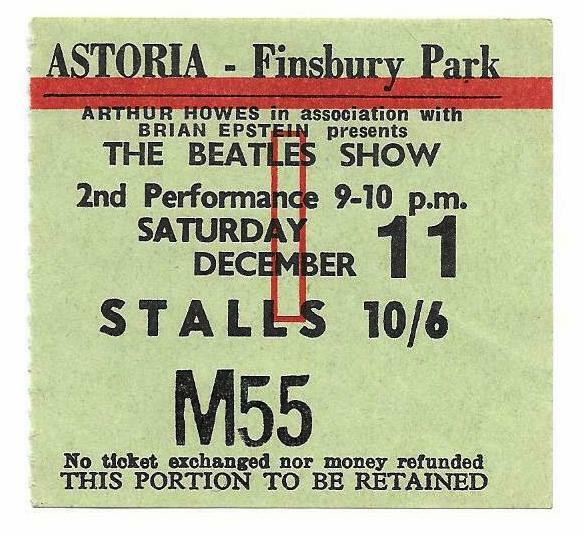 Offered is a nice clean original Beatles Concert Ticket Stub from their Finsbury Park concert which The Beatles played on December 11, 1965 !! It's just over 2.4"tall by 2.6" wide and in Excellent condition. The front of the ticket is very clean as is the backside. 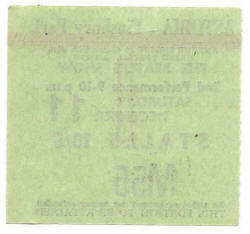 The left side of the ticket is perforated. The ticket is printed on fairly thin paper stock. Guaranteed Original. A Terrific Display Item! SPECIAL SALES PRICE $250. $200.